Mirrycle Corporation has just released its all-new Mirrycle Road Mirror, designed exclusively to fit Shimano* STI shifter/brake levers. Ingeniously engineered to fit almost all STI levers, the Mirrycle Road Mirror is designed to blend elegantly with today's bicycle components while allowing the continued comfortable use of the brake lever. 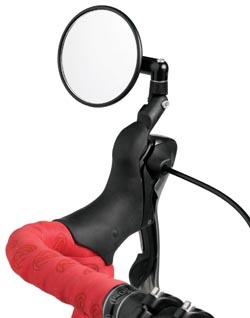 "What the Road Mirror does," explains Mirrycle Corp. President Barry Schacht, "is provide a great way to mount a rear view mirror on drop-style handlebars without taking up any of that valuable real estate. I'm condent bicyclists will appreciate the easy installation, the convenient location of the mirror, and the elegance of the product's design." the STI lever clip, slipping the mirror base over the lever clip, and placing the rubber hood back onto the clip. When mounted on the lever, the Mirrycle Road Mirror is located in the very best position for viewing to the rear. Just a ick of the eyes allows for a quick view behind. c, the Mirrycle Road Mirror is one of the best aids to cycling safety. The Mirrrycle Road Mirror can be attached to either the left or right side lever, and can be folded out of the way or quickly removed. All necessary tools are included. *Shimano STI and all lever names are the registered trademarks of Shimano, Inc. Founded in 1979 when bicyclist Barry Schacht needed a mirror for the drop-style handle bars of his road bike. When he couldn't find one currently on the market that suited his needs, he invented his own - and launched a company. His Original Mirrycle, which mounted with a hollow bolt to the brake levers of the time was an immediate international success. When the old-style brake levers changed, the company introduced the Mountain Mirrycle which mounted to the end of the handle bar on straight handlebars. In 1987, the company added The Original Incredibell Bell, followed by many other unique, high-quality bike bells, including the JelliBell, Brass Duet, among others. Mirrycle Corporation distributes its products through bicycle distributors. It is located in Boulder, Colorado.